Recipe Note: This is the bare bones recipe. Add your favorite mix ins! My favorite is pecans, dates, and a pinch of nutmeg! In a nonmetal bowl combine oats, brown sugar, applesauce, cinnamon and salt. Stir in milk; cover and chill for 8 to 24 hours. To serve, transfer oatmeal mixture to a medium saucepan. Heat just to boiling; reduce heat. Simmer, uncovered, for 5 minutes or until oatmeal is done, adding additional milk if desired and stirring occasionally. Remove from heat. Add your favorite mix-ins. Spoon into 2 bowls. Serve with additional milk, if desired. I’ve never tried steel cut oats! This oats look great! I love these. I use the Irish Oats (which I think are the same thing). I was never an oatmeal fan until I got rid of the instant stuff. I will have to try this method. Last Saturday morning it was chocolate pizzelles at 6:30am. My husband was a heck of a lot happier waking up to those. I LOVE oatmeal! This looks soooo tasty!! Let me know what you think when you do! I think they are almost exactly the same texture that you get when you spend the 30 minutes over the stove! tastier even! they were so yummy, thanks! YOU ARE AWESOME!! This is such a great tip. I had no idea. I love whole wheat pilaf (with milk, honey and berries or peaches) or steal cuts oats for breakfast, but I rarely make the time for it. Your idea to soak them could be a game changer. I’ll be trying this soon! 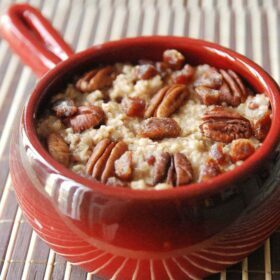 I love steel cut oats…I don’t like the fact they take a little longer to cook, but it’s so worth it. Love the twist you did on this recipe. I agree! Which is exactly why I fell in love with this recipe! No longer cooking time when you soak them overnight! Yes! 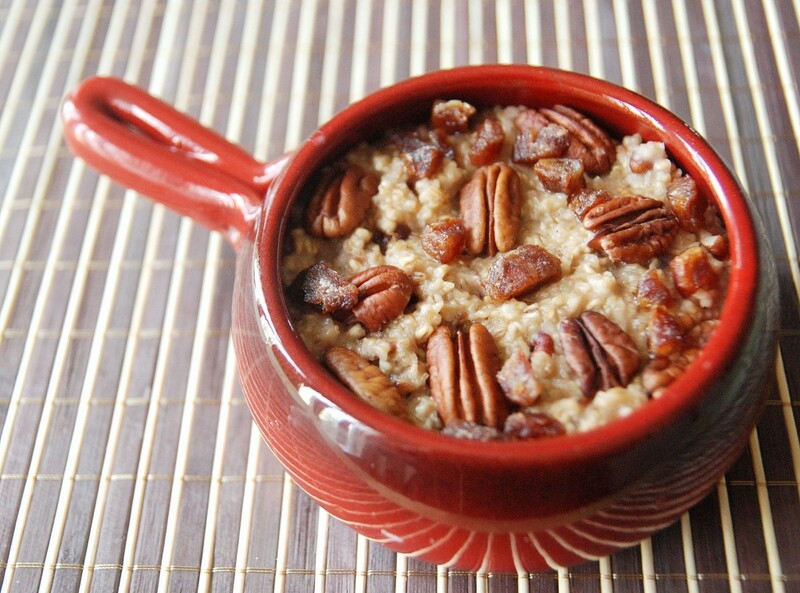 I love oatmeal…I haven’t actually had steel cut oats yet, but it will need to happen soon. I have been hooked on steel cut oats since I had it recently at Jamba Juice. I can’t steel cut oats in my grocery story? Are the named something else or am I looking in the wrong place?? Hmmm…I can find them in my regular grocery stores! I know for sure Whole Foods sells them, as does The Fresh Market. And as for my regular grocery store, Publix, they carry them in the oatmeal aisle. Maybe check the “health” food section of you grocery store? I’ve never had steel cut oats before. I just passed them in the grocery store today, but passed them by. I think I might have to pick them up! I bet they’d be really delicious with some maple cashew granola!!! Thanks for the tip about soaking the steel cut oats overnight. They look delicious! Oh yeah that looks good… and ALWAYS have fresh applesauce in my fridge…. super good. Try it with a splash of vanilla cream for example.. will def rock your world! thanks for the oats tip – never know how to handle the weird cousin! Making this, for sure! Thanks! We had this for breakfast this morning and it worked out pretty well, only it was perhaps a bit chewy so I think I’ll use more milk next time. But there will definitely be a next time, and soon. It’s so much nicer to have steel cut oats in 5 minutes instead of 45…… thanks for the inspiration! Steel Cut Oats are always supposed to be chewy. That is their appeal over regular old fashioned oats. They should not be hard, but should definitely have more of a chewy/nutty feel to them…which is why most people prefer them and think they have a more filling feeling. I doubt more milk would change that. Also, I usually only cook my steel cut oats for 30 minutes. So maybe by cooking them for 45 minutes in the past you have come out with a texture similar to Old Fashioned Oats oatmeal? LOVE LOVE LOVE overnight oats. Make them often. Chewy is definitely the textured outcome. Even better? The chewing takes longer to eat, so one might actually enjoy their food. Just sayin. I toss nuts, chia seeds, a scoop of almond butter and mashed bananas in there! I end up with loads of energy and full for hours! Great recipe! Flax seeds & chopped up dried apricots are my favorite add in! Thanks for passing along the overnight soaking tip! Boil the water, add a little salt. Add the oats, and then immediately take off the heat. The water will soak in over the course of an hour. add to a Tupperware container, adding cinnamon and brown sugar before sticking in the fridge. As a note — Wholefoods has the cheapest steel cut oats I can find. 99 cents per pound beats anything I’ve seen in any grocery store. 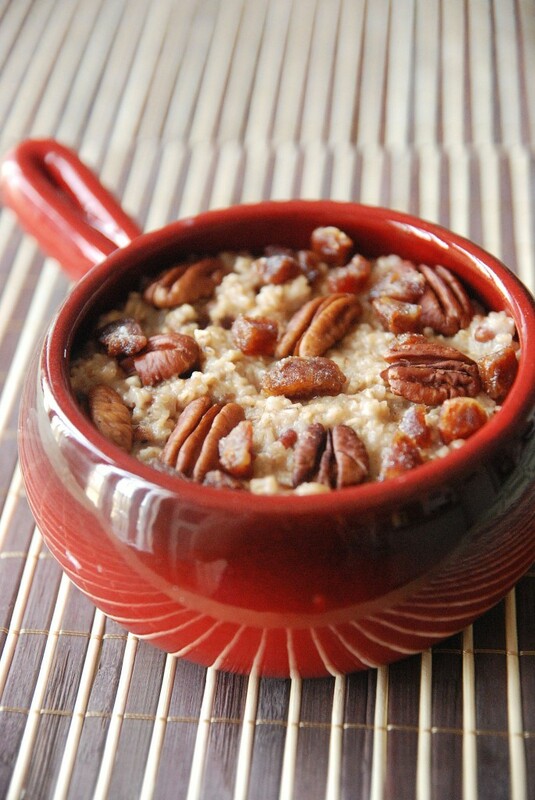 You can also cook Steel Cut Oats overnight in a crock-pot….depending on the pot either on the low or warm setting. Oh my goodness, this looks delicious. I love steel cut oats. Can’t wait to try it! Just made these this morning. Subbed the apple sauce for mushed banana. Threw in some walnuts and you have banana bread oatmeal! Delish. Thanks for a great recipe. my oats were still hard =( what i do wrong? Can you give me a little more info? Did you follow the directions exactly? I made these again last week without any issues…. Sorry your oats were still hard! Can you heat these in microwave instead of a saucepan? I personally have not tried it, but I believe you can! Just make sure and stir them often! Soaked mine in low-fat chocolate milk last night, and cooked them this morning for 10 minutes. Sprinkled walnuts and low-fat peanut butter powder on top after I dished them into my bowl. Oh yum!